A shallow one-sided Irish drum, typically played using a short stock with knobbed ends. The bodhrán is ubiquitous across Ireland, indeed wherever traditional Irish music can be found, drumming out its distinctive, muted notes in double-quick time. It looks like a large tambourine without cymbals, and this is no coincidence, as it's generally thought to have evolved from the tambourine which was itself a regular component of Irish music until the turn of the 20th century. This makes the bodhrán a surprisingly modern instrument in its current form, although various incarnations of this type of frame drum have existed in Ireland for centuries. The ultimate origin of the bodhrán is pleasingly mysterious: some say its origin is African, arriving in Ireland via the Spanish; some say that it came from Asia by way of Celtic migrants; others claim that it is thoroughbred Irish, having evolved, nunchuk-style, from humble farming implements (this is the version that the romantic in me chooses to believe). 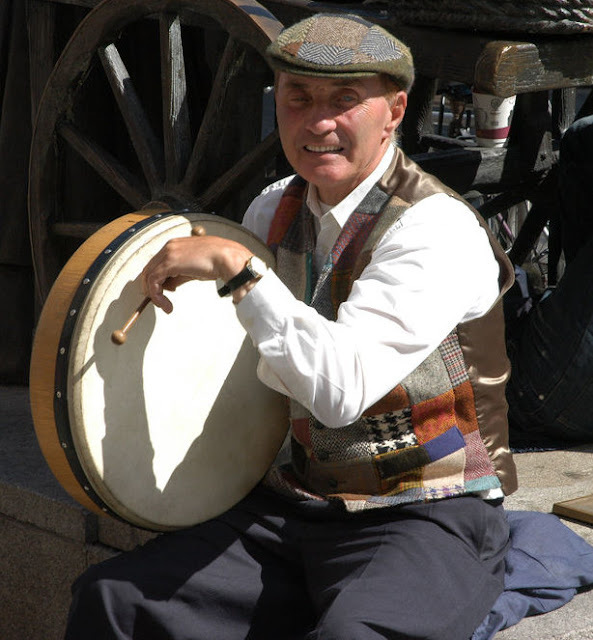 The bodhrán itself is a shallow, circular wooden frame, with the drum traditionally being made of goatskin. The opposite side is open, allowing the musician to place his free hand against the inside of the skin to control pitch and timbre. It can be played with the bare hand or a variety of beaters, the traditional style using a short wooden stick called a tipper (also a cipin). Striking different parts of the skin and using the other hand to control the tone, the bodhrán can actually sound different notes, allowing it to play in harmony with other musicians. As someone that plays various types of drums, I've given the bodhrán a try and I found it exceptionally difficult to play. Like many percussion instruments the first time you try them, it has the unsettling quality of making you feel like the most disjointed, uncoordinated oaf to ever pick up a beater. I mention this because, next to the fiddler and the flautist and the piper, the bodhrán player can seem like a bit of an afterthought. However, in the hands of a skilled player, the bodhrán can be truly breathtaking, easily standing as equal alongside the other instruments of Irish music. If you're wondering how you pronounce bodhrán, this can be tricky (I often find myself pausing before saying it to make sure I'm getting it right). Slight variations on the pronunciation can be heard (like this woefully English-sounding example), but generally the first syllable rhymes with bow (as in to bow down), and the second syllable rhymes with gone, so that you have bow-ron. Is that clear? Good. Now let's all go off and enjoy the craic. Have you ever had a go at the bodhrán? Did it make you feel as utterly inept as a human being as it did me? Are there any similar instruments where you're from? Do please drum out your comments below, and don't forget to share this post. This bodhrán looks like an extremely hard instrument to play. Look at the position of that guy's wrist! Although I do have a bad right wrist so after ten minutes of keeping mine like that, I'd be left with one useless hand. Maybe he has stronger wrist-muscles. Dunno. I've been told time and again that it's all in the wrist-action, Bibi, so maybe it's just not the instrument for the limp-wristed among us. hey Ed. Nice post and great choice of a bodhrán solo clip. To be technical, the án ad the end of bodhrán is pronounced more of a long aww sound as opposed to gone which has a shorter sound. Hi David - thanks for the comment and welcome to Lexicolatry. I tried to find a good quality sound clip to demo the pronunciation but I couldn't. So would you say that the second syllable rhymes more with the worn 'fawn', like 'bow-rawn', or maybe somewhere between 'gone' and fawn'?